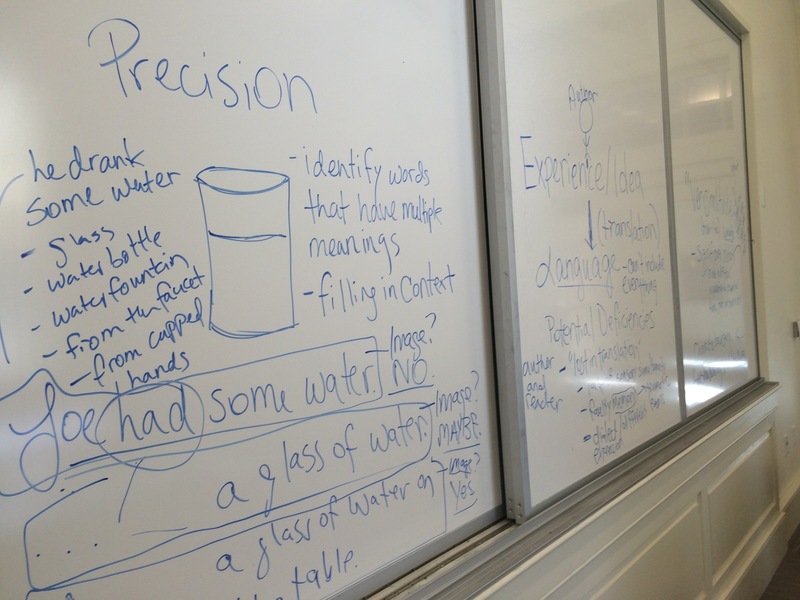 After talking about Janet Burroway’s Image chapter in Imaginative Writing, my class took our discussion to the white board to consider problems with translating experience and ideas in language, the fundamentals of significant detail, and the precision of language. —He drank some water; he has water to drink; he had water for watering his plants, etc. —He drank the glass of water; he had a glass of water to drink, etc. —He had water to drink on the table and he hadn’t finished drinking it. We explored the slippery nature of the word “had” in all of these cases, and then we thought about how context could change the sentences. We considered the difference between “a glass of water” versus a “water glass,” how the second doesn’t necessarily mean that the glass contains water, rather it could designated as a glass for water. Additionally, having the read come to “glass” before “water” would help form the image for the reader as it provides the container before what’s contained inside it.